With so much to explore, Ontario is difficult to cover in one short vacation. 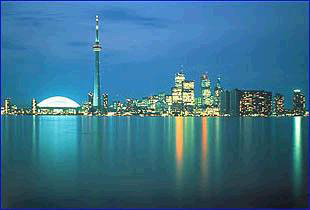 It manages to include both Canada‘s most populous city Toronto, and areas so remote that polar bears outnumber humans. It has a tranquil farm country in its southern region, growing diverse crops that include grapes and peaches. However, in the midst of this rural landscape are two small towns, Stratford and Niagara-on-the-Lake that stage some of the finest theatre in North America. There is an incredible wealth of water — the five Great Lakes, the St. Lawrence andOttawaRivers, and 250,000 inland lakes with numerous islands. 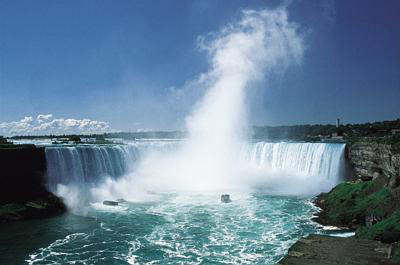 In addition, there is Niagara Falls, the most famous water spectacle of them all. Toronto has left its demure Victorian past behind. Today, the city vibrates as a cosmopolitan financial, commercial, and cultural centre blending its multicultural heritage with over a 100 ethnic groups speaking more than 150 languages with urban chic. 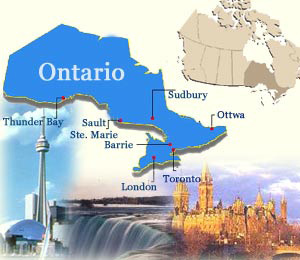 It has Canada’s major stock exchange, and a large film and television production industry. You will also find soaring contemporary architecture, along with Victorian and Edwardian gems, museums, performing-arts companies, professional sports teams, fine restaurants and relaxing cafes, trendy shopping complexes, and a people-friendly waterfront. Hundreds of parks keep it green for most of the year. In short, Toronto offers all the amenities of a large city in environs that are clean and safe. One of the world’s most famous travel destinations, these impressive 170-ft-/53-m-high falls on the border of the U.S. and Canada continue to offer the same combination of natural wonder and commercial tackiness that has inspired visitors since the 19th century. Even if you are not on your honeymoon, they are well worth seeing. The area can be seen in a day, but we recommend an overnight stay to view the falls and rapids under different lighting conditions from both sides of the border.